This year, for the first time, we had the good fortune to participate in the Summer Book Exchange hosted by The Educators’ Spin On It. Bloggers from around the world were matched up and the paired blogs exchanged packages which contained a book and creative activities to go along with the book. I encourage you to head over to The Educators’ Spin On It to meet the other bloggers involved in this fun exchange. The Sugar Snaps were so excited to open the box Jodie sent us. 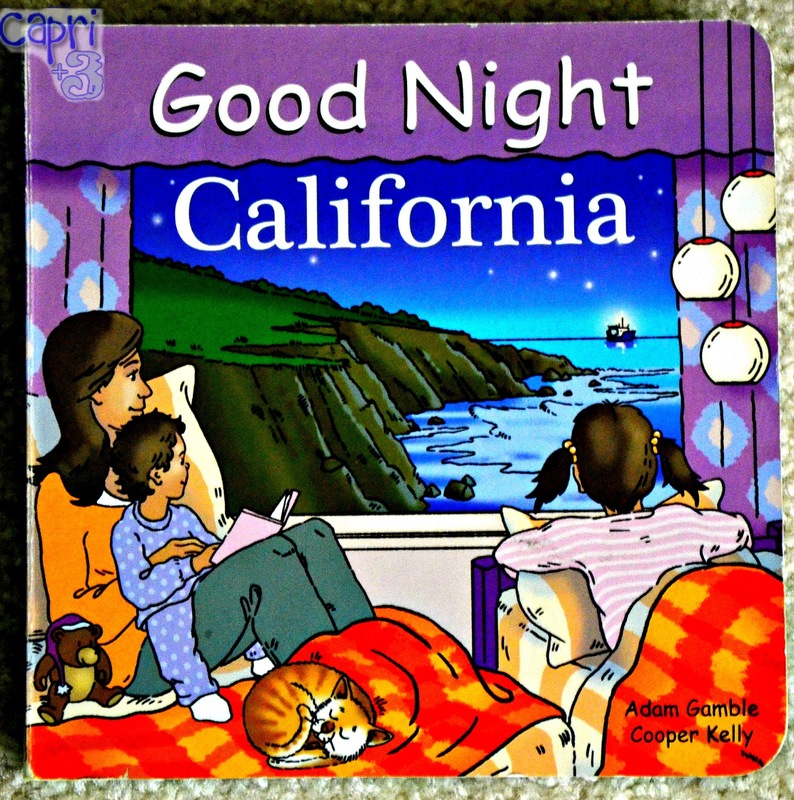 The book she chose was Goodnight California by Adam Gamble and Cooper Kelly. This book is part of the Goodnight Our World series. Children can say goodnight to the place they live or any number of areas in the world as an educational experience. The Sugar Snaps loved the colorful illustrations. 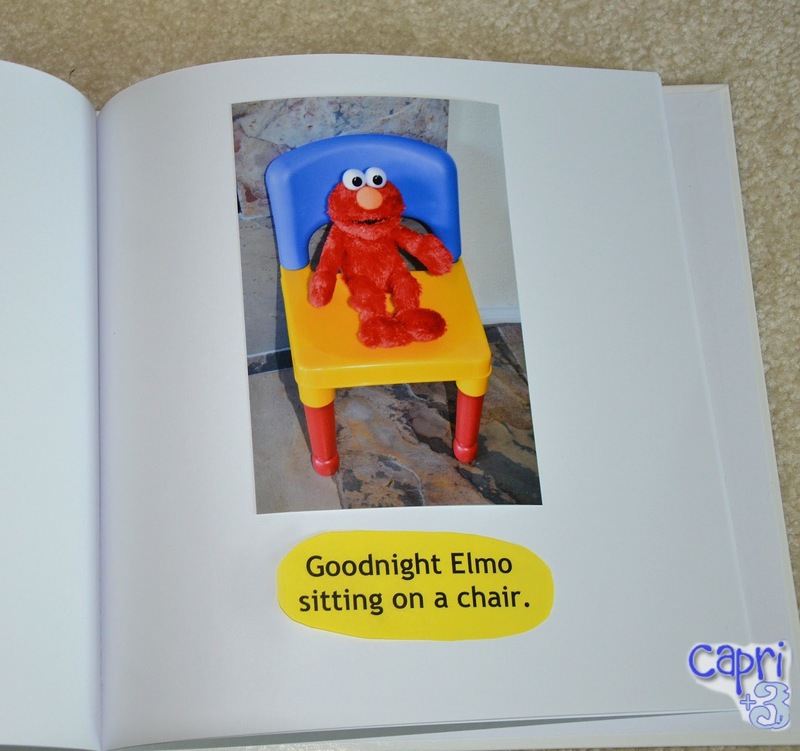 Jodie came up with a great series of “goodnight” themed activities and crafts. The first activity we tried was the foam letters that Jodie made by writing each of the letters of the Sugar Snaps’ names onto foam shapes. They are learning letters right now so this was perfect for them. She suggested that we add food coloring to the water (as we often do) and they chose blue. 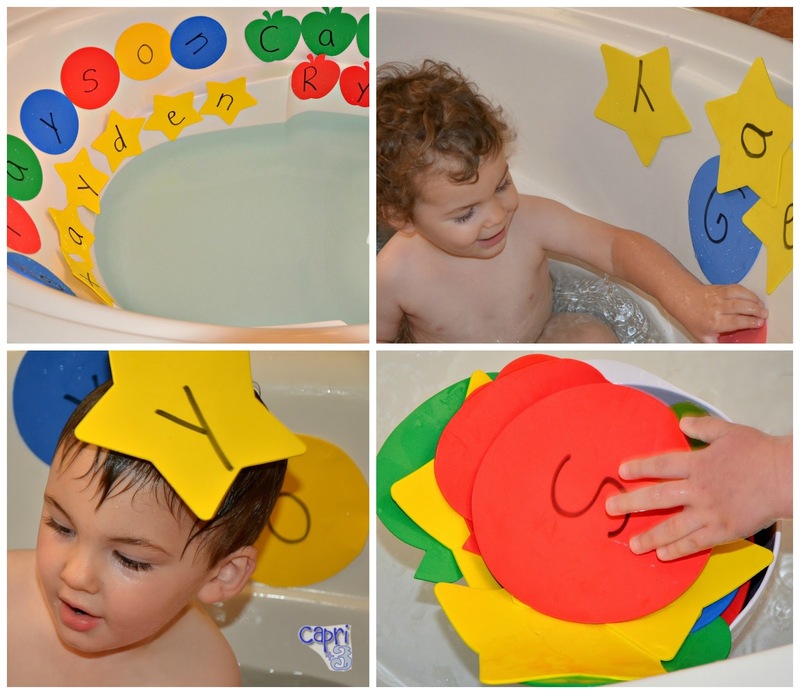 They loved seeing their names in the bath and Ryder made himself a fashionable star hat. From set-up to clean up, they had a great time with the letters. The next activity she sent us was a gratitude journal. She suggested that the Sugar Snaps say something they are grateful for each night that we record in their journal. Gratitude is an awfully big word for them at age two and a half, so I opted to call it the Thank You Book. I covered the book in wrapping paper and printed the book’s title onto regular printer paper. We used the phrase “thank you for…” because it made sense to the Sugar Snaps. On our first night, Xayden went first and said, “Thank you for Mama and Daddy.” Capri went next and said, “Thank you for crackers.” Grayson said, “Thank you for crackers….cookies.” Ryder went last and said, “Thank you for breakfast in bed.” I love that they have expanded their definition of “thank you” with this fun activity. The next activity we tried was lacing shoe strings through holes Jodie punched around plates. They had so much fun lacing the plates and were really excited to eat a snack later that night using their special plates. In the picture below, Capri found it funny to skip a hole right at the end. For our final activity, Jodie sent us a blank book and suggested that we write our own bedtime story. The Sugar Snaps pointed to things in the house that they wanted to say goodnight to and I took pictures of them. It turned out to be all toys. I asked them if they wanted to say goodnight to anything else and they decided to say goodnight to each other. So, our book title ended up being, “Goodnight Toys. Goodnight Us.” I photographed their toys in such a way that there could be an action associated with them, such as animals taking a bath or the hat sliding down the slide. They love to see the familiar pictures of themselves and their toys at bedtime. We had so much fun with these great activities from Jodie of Growing Book by Book. We appreciate the opportunity to participate in the Summer Book Exchange and are grateful to Amanda and Kim of the Educators’ Spin On It for hosting this wonderful exchange of books and ideas. Did you participate this year? Feel free to leave links to your posts. Have you ever done a book exchange? If not, you may want to get your community involved and host your own. Your pictures are great! So glad you enjoyed the activities. It was great being partnered with your family. Thank you! Thank you so much Jodie. They loved all of the activities and the book you sent. We had so much fun making the package for you and receiving your wonderful package too. Jodie did a great job coming up with fun activities to go along with the book and it looks like you and your crew had a lot of fun! I love your creative twists on the activities. This is my first time visiting your blog, I am definitely going to follow now. Our kids are close in age. I am going to share your post next week on my facebook page when the Love Books Summer Exchange goes live! Thank you so much! That is great that our kids are close in age. Thank you for sharing my post next week. I will head over to Stir the Wonder now. Thank you so much for participating in the Summer Book Exchange! It's so much fun to see all the kids engaged with fun activities and books! Jodie sent you so many fun activities. Love the lacing picture, too cute! Can't wait to see what you sent to her! It was so much fun participating. I really appreciate that you hosted such a fun event. I can't wait to read all the posts. Thank you so much! Sounds like a fun exchange full of ideas. Thank you for coming over. It was such a fun exchange of ideas and a great introduction to a new (to us) book. Thank you for hosting KLBH. That is a great resource for book reviews. The exchange was lots of fun. I would love to participate in the Summer program next year! So inspired by the activities with this book. Love the Thank You/Gratitude idea. I think its important to teach at a young age to be grateful for the things we have in life. Wonderful post! thanks for sharing on Kid Lit Blog Hop! Wow, first of all 4 toddlers, and energy for fun activities, that has blown me away. Second, wonderful blog, I am totally in awe. Thirdly, fantastic book, great activities, the summer book exchange sounds excellent. Thanks so much for joining us on the Kid Lit Blog Hop. WE hope to see you all again soon. Thank you for hosting the Kid Lit Blog Hop. I appreciate being able to join in. We had fun reading Goodnight California and doing all of the activities. I hope to join in the Kid Lit Blog Hop again in the future. The Educators' Spin On It invites blogs to participate each year. This is the first year we participated and we will be back because it was so much fun. You should join in next year! Thank you so much for hosting the Kid Lit Blog Hop. That is such a great idea for a hop to find out more about children's literature. 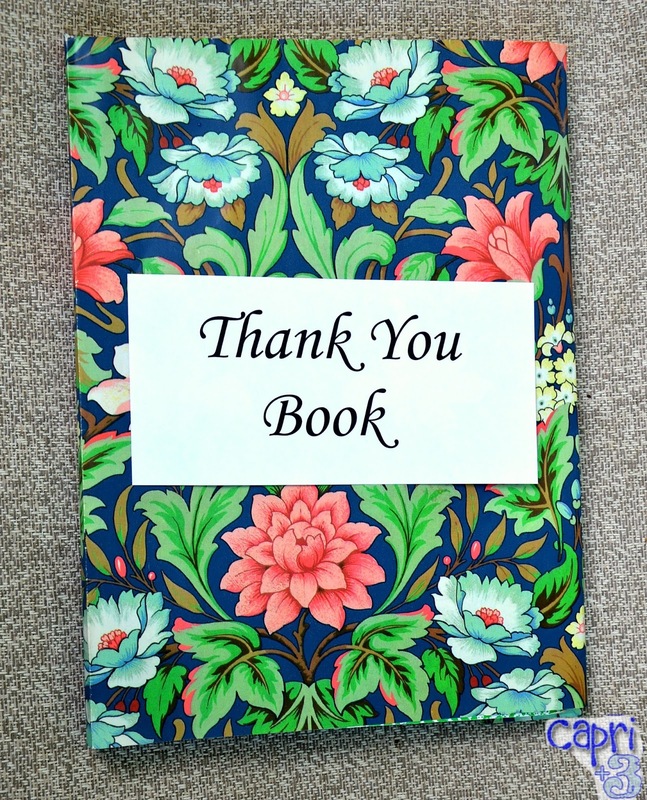 What a lovely book activity and book exchange! I love Growing Book by Book's blog and it was fun to read about the exchange! Coming by via the Kid Lit Blog Hop. I really enjoyed participating in the Kid Lit Blog hop. Thank you! 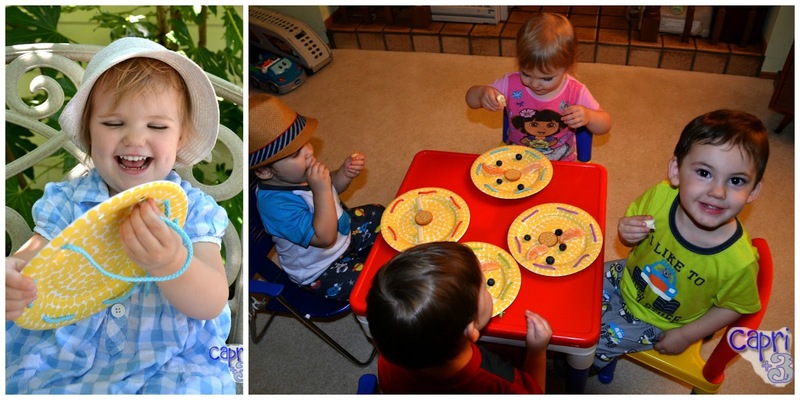 It is amazing how fast our little ones have grown since the picture in the header was taken. I want to experience all of their little moments. Thank you for coming over. It is wonderful that the exchange provided a way for so many people to connect. The Kid Lit Blog Hop was another wonderful way to connect and exchange ideas.